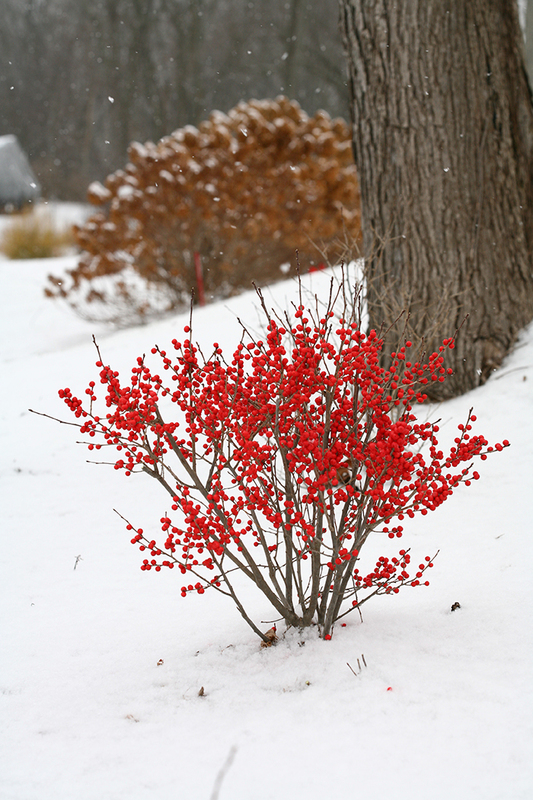 When people see our winterberry hollies (Ilex verticillata), they’re immediately intrigued. It’s no wonder: these native shrubs are stunningly beautiful at the dreariest time of the year. Winterberry holly grows native over a huge swath of North America – eastern Canada all the way through the southern US and as far west as Texas – so it is very hardy (down to USDA zone 3) as well as very heat tolerant (through USDA zone 9). Unlike the classic “Christmas” holly, winterberry holly loses its leaves every autumn, which makes its crop of bright red or yellow berries even more striking. 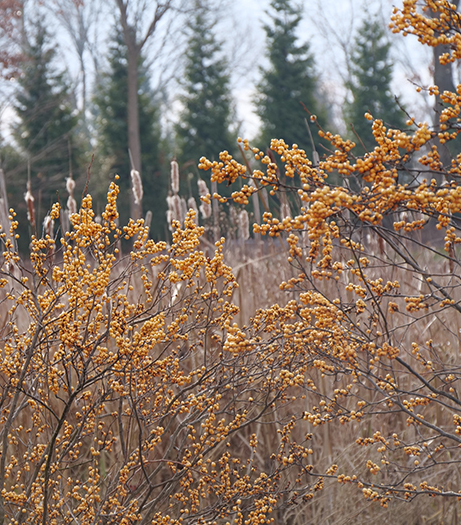 However, getting those berries is precisely why questions about this beautiful native shrub fill our inbox all year. Winterberry holly is dioecious (dye-oh-ee-shus, Greek for “two houses”). In other words, each individual plant bears only one type of flower: those that will turn into berries (a female plant) or those that bear pollen (a male plant). This means that to get a beautiful, berry-covered winterberry holly, you must plant both a male and a female. Male hollies will never develop berries, so they aren’t very showy. Fortunately, you only need to plant one to pollinate up to five female plants. The male and females can be planted anywhere within about 50’/15.25m of one another, so you can use your prime real estate for the showy female(s) and tuck the male plant in an out-of-the-way spot in your landscape. 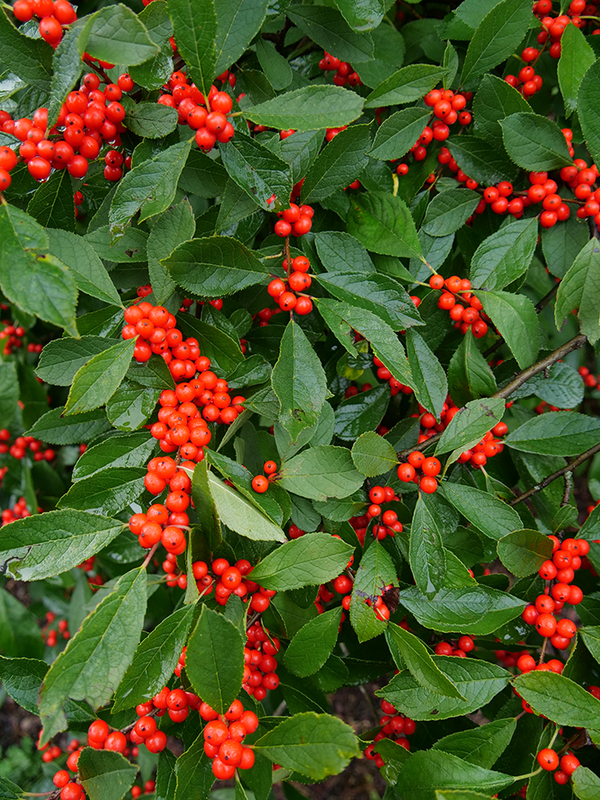 If you’d like to plant winterberry holly in your yard, first select a female plant with the qualities you’d like: size or quantity of berries, color of the berries, and/or plant size. Once you’ve determined which female variety you want, check the tag for which male variety will be compatible. That recommendation will be based on the blooming period of the two plants, which must overlap exactly. There are two distinct bloom times among winterberry hollies: early and late. Though the difference is usually just a matter of a week or two, male and female plants must be from the same group. When possible, they should also be selected from the same genetic line, which is indicated by similar names – for example, the ideal pollinator for Little Goblin Red is Little Goblin Guy, and the ideal pollinator for Berry Poppins is Mr. Poppins. All Proven Winners varieties are in the early blooming group, so our two male pollinators are interchangeable with any of the female varieties we offer. If the ideal Proven Winners male pollinator is not available, ‘Jim Dandy’, a widely-grown older selection, is suitable. Do not use the other widely-grown male, ‘Southern Gentleman’, as this belongs to the late-blooming group. If you just purchased the plants, they were likely stored in a greenhouse by a grower or garden center during the previous winter. This causes them to bloom earlier than plants that winter naturally outdoors. Therefore, it is possible they would have bloomed before you purchased them and that pollination did not occur under those conditions. 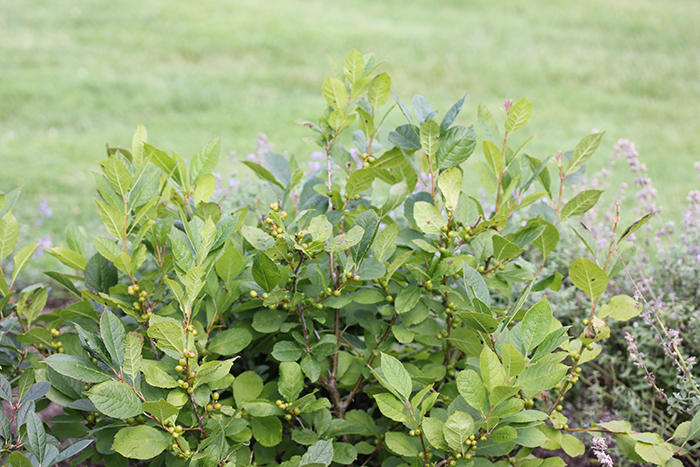 As such, new plants may not have any berries their first winter after planting. Like most shrubs, winterberry hollies bloom and subsequently fruit best when they are established – usually after 2-3 years in the ground. Newly planted winterberries (and especially very small plants that are sold online) will need some time to develop a good root system and put on new growth before they will fruit to their full potential. If your winterberry hollies experience drought stress, they may not form fruit or may drop any fruit that was beginning to form. In dry soils, provide plenty of water and a good 2-3”/5-7cm layer of mulch to prevent plants from drying out too much. Winterberries are quite shade tolerant, but in very dark conditions, flowering and fruiting can be significantly diminished, or may not occur at all. We recommend a minimum of four hours of sun each day, or filtered light throughout the day, for the best display. This encourages abundant flower production, pollination (which relies on insects, who prefer sunnier conditions), and subsequently, fruit production. If you need to transplant a winterberry holly that’s in too much shade, early spring is an ideal time to do so. If a male plant is not in the vicinity, or the bloom times of the male and female plants do not overlap, berries will not develop on the female plants. If you aren’t sure whether your plants are male or female, and which ones are which, the only way to tell for certain is to look at the flowers when the plants bloom, usually in late May/early June in the Midwest (a bit earlier in warm climates, a bit later in colder areas). 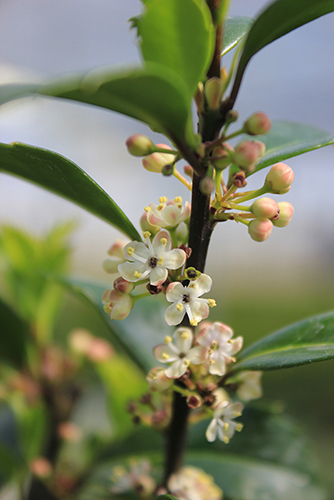 The flowers on female plants will have a raised green nub in the center, which turns into the berry; the flowers on male plants have recessed centers and a crown of fluffy yellow pollen-bearing anthers. If you can’t tell which is which from the flowers, you are welcome to contact us with photos and we can identify them for you. Fun fact: female flowers often have a few false anthers around the berry in the center, but they don’t actually bear any pollen. They’re only to fool pollinating insects into visiting by making them think they’re going to get a snack. However, even when the fake anthers are present, you are unlikely to mistake a female plant for a male due to the prominence of the green berry in the center. If fruiting is very sparse, this may indicate an unsuitable male, too few males for the number of female plants, or that the male is planted too far from the females. Winterberry hollies bloom on old wood – in other words, they create their flower buds for the following year during late summer/autumn of the current year. That means if you prune a winterberry holly in spring, you’ll be cutting off flower buds. 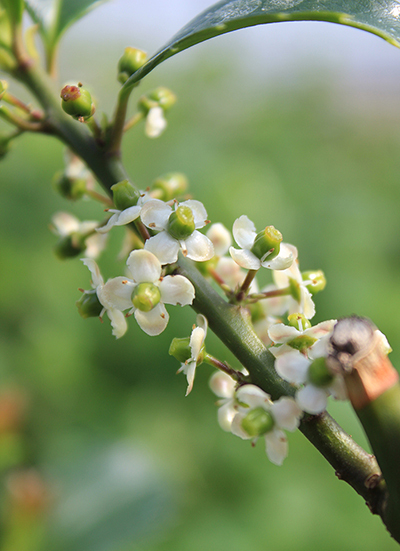 Other plants that bloom on old wood are typically pruned immediately after they bloom. However, in the case of a winterberry holly, pruning after bloom would remove the developing fruit as well. So, what’s a gardener to do? We recommend not pruning winterberry hollies, period. Plant them so that they can grow to their full potential without pruning or cutting back. One of the advantages winterberry hollies have over other shrubs grown for their berries is that birds will eat them, but only after they’ve been softened by repeated freezing and thawing. However, there’s always the possibility that hungry critters will make an unexpected meal of the fruit and it may disappear mid-winter. Don’t worry about deer, though – they won’t touch winterberry holly. After being pollinated in late spring/early summer, the tiny green berry grows and becomes rounder, but stays green until early autumn. It’s easy to miss them until they actually color up. 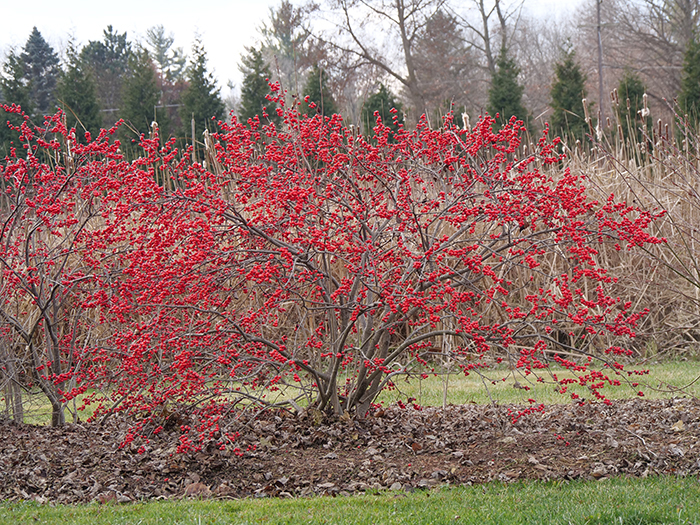 View all of our winterberry hollies here.